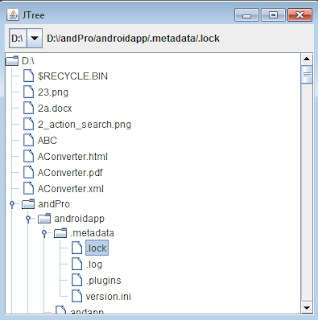 JTree is a component that can be used to display data hierarchically. Below are some useful constructors and methods of the JTree class. creates a tree that its data are from TreeModel, tm. creates a tree with the specified root node. returns the selected path of the tree. returns the last selected node of the tree. sets the data model of the tree. A tree can have many nodes. The tree always starts with a root node. A root node is parent of all its child nodes. A node can have at most one parent and two child nodes. A node that does not have a child is call leaf node. To create node, you can use the DefaultMutableTreeNode(Object object) class. The instance of this class is node object that can be added to the tree. To determine whether or not a node is a leaf, a root, you can use the isLeaf(), isRoot() methods respectively. You can also add a child node to its parent node by using the add(TreeNode childNode) method. A tree generate tree selection event. So you need to implement the TreeSelectionListener interface and override the valueChanged(TreeSelectionEvent e) method to perform action. 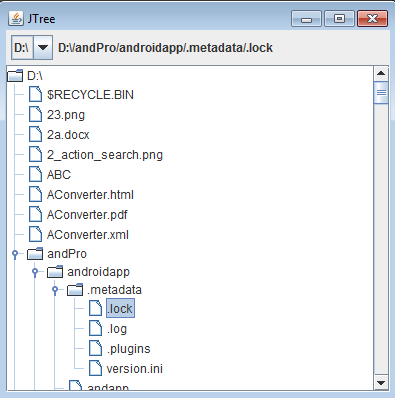 The example code below creates a tree to display a hierarchical files and directories in a drive. When the program firstly starts, the tree displays the files and directories in the drive determined by the first item of the combobox. You can change the drive so that it leads to the change of the files and directories by selecting a drive from this combobox. When the user selects a node of the tree, the program checks whether this node of the tree is a directory or a file. If it is a directory, its sub-directories and files are listed.